The ChemE and I have been working on eating healthier. I discovered, as I was going through our bank statements, that we were eating out entirely too much! I won’t divulge numbers, but we spent enough money on eating out one month, I could have bought double the groceries I usually do. So, I started scouring websites for interesting recipes to take the place of the ho-hum, humdrum stuff we usually have. That is when I came across this recipe on Pinterest. It looked wonderful. I like mushrooms, especially portobella mushrooms, and who doesn’t like pizza?! Plus, I knew the kiddos wouldn’t eat it, but they could make their own pizzas, which gets them in the kitchen and cooking, while having fun. Win, win, win! Preheat the oven to 400*F. Clean the mushrooms by wiping them with a damp cloth or paper towel. (Do not rinse the mushrooms under running water. Mushrooms have a lot of water in them naturally. By washing them under running water, you will only add more water to them. I promise, wiping them with a damp cloth will clean them!) Remove the stem and clean out the inside “gills” with a spoon. Place on a foil lined baking sheet and bake for 7 minutes. A lot of water will draw out of them. You can take a paper towel and soak up any excess water. When you have gotten the water absorbed, put a tablespoon of pizza sauce inside the cap. 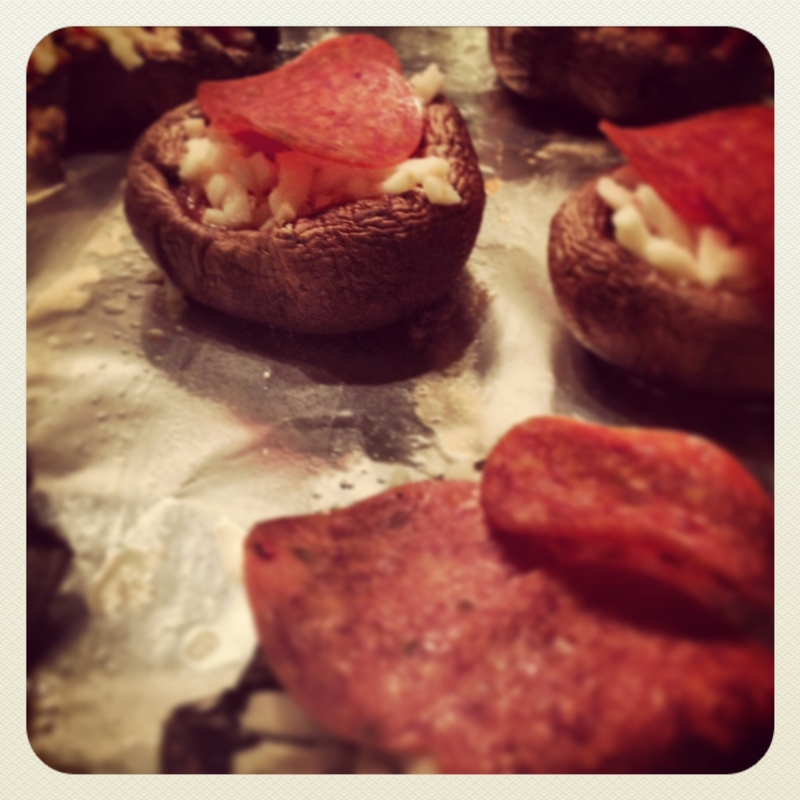 Top with mozzarella cheese and pepperoni. Turn on the oven broiler (HIGH) and broil for 3 minutes or until the cheese has melted and started to brown. Obviously, you can add anything you like. The original recipe called for black olives. But the ChemE has a deep seated aversion to any kind of olive, so none for us.